Peace Corps Online: March 13, 2003 - San Pedro Sun: Peace Corps volunteer Miki Kim. at AIDS Info "Desk"
March 13, 2003 - San Pedro Sun: Peace Corps volunteer Miki Kim. at AIDS Info "Desk"
Peace Corps Online: Directory: Belize: Peace Corps Belize : The Peace Corps in Belize: March 13, 2003 - San Pedro Sun: Peace Corps volunteer Miki Kim. at AIDS Info "Desk"
Peace Corps volunteer Miki Kim. at AIDS Info "Desk"
The San Pedro AIDS Commission, a branch of the National AIDS Commission, is proud to announce they have established an information "desk" at the San Pedro Lions Clinic on Lion Street. Manning the desk Monday through Thursday from 8:30 a.m. to 12:00 noon and 1:00 to 4:30 p.m. is Peace Corps volunteer Miki Kim. Informative pamphlets and other literature regarding HIV/AIDS are available to the general public free of cost. Vive condoms are also for sale at the desk. In other news, the San Pedro AIDS Commission is sponsoring an essay contest in celebration of World AIDS Day on December 1st, 2002. The objective of this contest is to raise awareness and prevent the spread of this deadly disease that causes so much grief to our world. The San Pedro AIDS Commission invites the youth of San Pedro to write an essay that reflects this year's theme, "Live and Let Live," in respect to the AIDS epidemic in Belize. The criteria for the contest is as follows: (1) Anyone between the age of 13 and 18 is eligible. (2) Essay must be at least two pages in length, written on one side of a 10.5" by 8" sheet of paper. (3) Name, age, phone number and address should be written on the back of each page. (4) Use black or blue pen. No pencil. 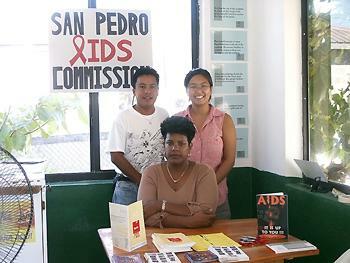 All entries should be submitted at the San Pedro AIDS Commission information desk or mailed to the attention of Felix Ayuso, President, San Pedro AIDS Commission by November 25th, 2002. The winners will be announced at a special ceremony on World AIDS Day and cash prizes will be awarded to the top three writers. First Place - $100, Second Place - $75 and Third Place - $50. Anyone wishing more information regarding the San Pedro AIDS Commission or the essay contest may contact Mr. Felix Ayuso at telephone 226-2070 during normal working hours.